Who doesn’t love an exciting roller coaster ride? Place the Wheelies vehicle on the easy-load ramp and turn the crank with that familiar ‘click-click-click’ as it heads to the top! Then ZOOM! Down it goes and pops out of the lion’s mouth at the end. Ready to ride the ferris wheel or take another trip to the top? 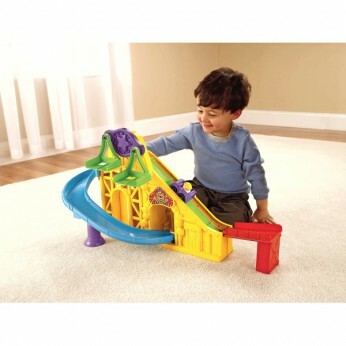 Includes play set with one Wheelies vehicle…. This toy costs approximately £14.99 (for the latest and best prices make sure you check our retailer list for the LP Wheelies Rollercoaster Playset above). In our review of LP Wheelies Rollercoaster Playset we classed it as being suitable for ages 1 to 3 years, 3 years, 4 years but recommend you check the manufacturer specific advice before purchasing.